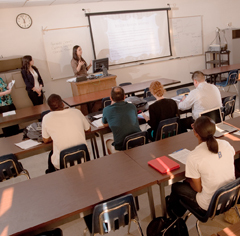 The Advanced Educational Studies Department at CSU Bakersfield prepares school administrators, counselors, and special education teachers. Our programs and services prepare students for degrees and specific credentials required in the State of California for service in specialist and administrative positions that require advanced preparation and special competence. These programs also provide in-service educational opportunities for persons currently filling such positions. The Advanced Educational Studies Department offers advanced services and specialist credential programs in Educational Administration, School Counseling, and Special Education. The California Commission on Teacher Credentialing (CCTC), as authorized by the Teacher Preparation and Licensing Law of 1970, and the National Council on the Accreditation of Teacher Education (NCATE), has approved these specialist and advanced services credentials. Please click the links to the left for more information on our programs.